The Legio duodecima Fulminata ("Thunderbolt Twelfth Legion"), also known as Paterna, Victrix, Antiqua, Certa Constans, and Galliena, was a legion of the Imperial Roman army. It was originally levied by Julius Caesar in 58 BC and which accompanied him during the Gallic Wars until 49 BC. The unit was still guarding the Euphrates River crossing near Melitene at the beginning of the 5th century. The legion's emblem was a thunderbolt (on a shield fulmen). In later centuries it came to be called commonly, but incorrectly, the Legio Fulminatrix, the Thundering Legion. The Twelfth legion, as it is perhaps better known, fought in the Battle against the Nervians, and probably also in the Siege of Alesia. The Twelfth fought at the Battle of Pharsalus (48 BC), when Caesar defeated Pompey. After Caesar won the civil war, the legion was named Victrix, and enlisted in 43 BC by Lepidus and Mark Anthony. Mark Anthony led the Twelfth, renamed XII Antiqua during his campaign against the Parthian Empire. During the latest part of Augustus' principality, XII Fulminata served in Syria, camping at Raphana. They also were the Lost Legion in Syria. From his eastern Parthian Empire in present-day Iran and Iraq, King Vologeses I in 58 AD invaded Armenia, a client kingdom of Rome. Emperor Nero ordered Gnaeus Domitius Corbulo, the new Legate of Cappadocia, to manage the matter. Corbulo ordered Legion IV Scythica from Moesia, and along with the III Gallica and VI Ferrata defeated the Parthians, restoring Tigranes VI to the Armenian throne. In 62 AD, the XII Fulminata joined the IV Scythica, now commanded by the new Legate of Cappadocia, Lucius Caesennius Paetus. Both legions were defeated by the Parthians and Armenians at the battle of Rhandeia; after surrendering, the legions were shamed and removed from this theater of war. In 66, after a Zealot revolt had destroyed the Roman garrison in Jerusalem, the XII Fulminata, with vexillationes of IV Scythica and VI Ferrata, were sent to retaliate. This force was sent back by Gaius Cestius Gallus, Legate of Syria, when he recognized the legion was too weak. On its way back, XII Fulminata was ambushed and defeated by Eleazar ben Simon in the Battle of Beth Horon, also losing its aquila. However, XII Fulminata fought well in the last part of the war, and supported its commander T. Flavius Vespasian in his successful bid for the imperial throne. At the end of the war, XII Fulminata and XVI Flavia Firma were sent to guard the Euphrates border, camping at Melitene. Translation: (In recognition of) Imp(erator) Domitian Caesar Aug(ustus) 'Germanic', (by) Lucius Julius Maximus, (a member of the) Leg(ion) XII Ful(minata). Some historians argue that the settlement of Ramana near Baku was possibly founded by the Roman troops of Lucius Julius Maximus from Legio XII Fulminata in circa 84-96 AD and derives its name from the Latin Romana. Facts that strengthen this hypothesis include: a military-topographical map of the Caucasus published in 1903 by Russian administrators, which refers to the town as "Romana"; various Roman artifacts found in Absheron region; and records that old(er) inhabitants referred to their town as Romani. The legion was probably in Armenia during Trajan's campaign of 114 AD, that ended with the annexation of the Kingdom of Armenia. In 134, the threat of the Alans was subdued by the governor of Cappadocia, Arrian, who defeated the invaders with the aid of XII Fulminata and XV Apollinaris. The Twelfth probably fought in the Parthian campaign of Emperor Lucius Verus, in 162-166, if a mixed unit of XII and XV controlled for some time the newly conquered Armenian capital Artaxata. Emperor Marcus Aurelius commanded the XII Fulminata in his campaign against the Quadi, a people inhabiting an area in modern-day Slovakia, and an episode of a miraculous rain and lightning saving a Twelfth subunit from defeat is reported by the sources. At this time, most of the Twelfth was composed chiefly of Christians. There was a belief that this had led to the emperor issuing a decree forbidding the persecution of the Christians, but this seems to have been based on a forgery. In 175, the legion was in Melitene, when Avidius Cassius revolted; the Twelfth, having been loyal to the Emperor, obtained the cognomen Certa Constans, "surely constant". After the death of Emperor Pertinax, 193, XII Fulminata supported the governor of Syria, Pescennius Niger, who was in the end defeated by Emperor Septimius Severus. When the Eastern frontier of the Empire was moved from the Euphrates to the Tigris, the Twelfth stayed in the reserve, possibly as a punishment for its support of Severus' rival. The region around Melitene was one of the first in which Christian faith spread. Polyeuctes is a martyr under Valerian who was a soldier of the Twelfth. 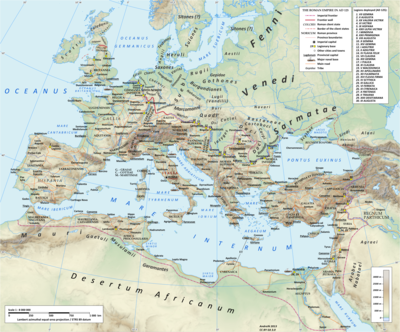 The Sassanid Empire was a major threat to the Roman power in the East. King Shapur II conquered the base of the XV Apollinaris, Satala (256), and sacked Trapezus (258). Emperor Valerian moved against Shapur, but was defeated and captured. The defeat caused the partial collapse of the Empire, with the secessionistic Gallic Empire in the West and Palmyrene Empire in the East. It is known that the XII Fulminata was under the command of Odaenathus, ruler of the Palmyrene Empire, but also that Emperor Gallienus awarded the legion with the cognomen Galliena. After these episodes, the records of the Fulminata are scarce. The Palmyrene Empire was reconquered by Aurelian; Emperor Diocletian defeated the Sassanids and moved the frontier to Northern Mesopotamia. The Twelfth, which probably took part to these campaigns, is recorded guarding the frontier of the Euphrates in Melitene, at the beginning of the 5th century (Notitia Dignitatum). In Rick Riordan's book The Son of Neptune, the Twelfth Legion went to America after the fall of Rome following the Roman gods as they moved across Western Civilization, with Mt. Olympus reforming in Manhattan. The Legion settled at San Francisco where they founded the Roman demigod camp, Camp Jupiter. The legion's eagle standard had been found by the Twelfth Legion and subsequently lost again in Alaska during the 1980s. It was recovered by Frank Zhang, Hazel Levesque and Percy Jackson years later. In Mikhail Bulgakov's book The Master and Margarita, Pontius Pilate mentions the Legion during his meeting with Caiaphas. He threatens using the Legion in bloody pacification of possible future Jewish rebellion, along with auxiliary Arab cavalry. The fiction book Rome: The Eagle of the Twelfth by M.C. Scott is based on the legion during the Jewish rebellion. Forty Martyrs of Sebaste, a group of Roman soldiers in the Legio XII Fulminata described by Basil of Caesarea as being martyrs for their Christian faith in 320. ^ Raoul, McLaughlin (2016). The Roman Empire and the Silk Routes: the Ancient World Economy and the Empires of Parthia, Central Asia and Han China. Havertown: Pen and Sword. ISBN 9781473889828. OCLC 961065049. 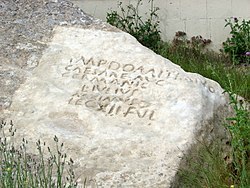 ^ The word 'Germanic' in the carving refers to Domitian himself; he was given this sombriquet after his death in 84 AD, thus suggesting the inscription dates to after his death. "Gobustan Museum in the Open Air | Bea Broda". beabroda.com. Retrieved 2018-08-26. ^ Reportedly, these markings constitute the most easterly evidence of Roman soldiers' movements. James, Marriott. The oil road: journeys from the Caspian Sea to the city of London. Minio-Paluello, Mika (Updated paperback ed.). London. ISBN 9781781681282. OCLC 852808221. Herbermann, Charles, ed. (1913). "Thundering Legion" . Catholic Encyclopedia. New York: Robert Appleton Company. ^ Homilies xix in Patrologia Graeca, XXXI, 507 sqq. Church History of Eusebius, Book V, chap V, Online copy of (an English translation of) Church History by Eusebius of Caesarea, where Eusebius describes the legion's miracle of rain event.